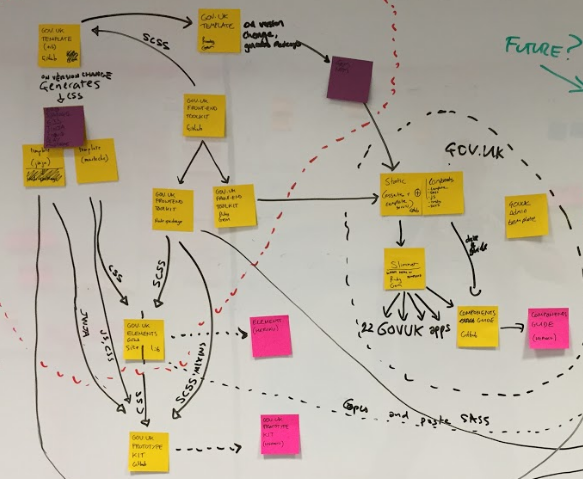 Over the summer at GDS we ran a discovery on the tools and resources teams in government use when designing their services. We wanted to understand how design happens in teams, what information people use when they design and what problems and challenges they face. We ended up speaking to about 40 people. Primarily interaction designers, content designers and front-end developers from HMRC, DWP, Home Office, Ministry of Justice and GDS. Firstly, thank you to everyone who took time out of their day to talk to us, participate in a lab session or fill out a survey. It was hugely useful and a reminder that even when you have the same job as your users, you are still not your users. We’re going to use what we’ve learned in discovery to make some real improvements to the tools and resources GDS offers to designers and front-end developers. For example, we’re about to kick off a project to make the front-end code of GOV.UK much easier to work with and contribute to. The alpha phase of the project will focus on prototyping a single package of front-end code that would replace the multiple ones we have today. Thanks to your help, we now know a lot more about the features and technologies this product would need to support. Once we’ve got our front-end in shape we’ll be in a much better place to develop design patterns and components as a community. That’s the ultimate goal. We’ll report regularly on our progress. At some point we will be asking for your input in testing prototypes.